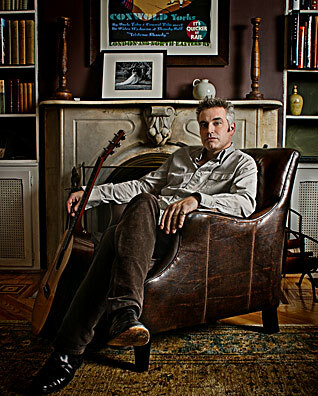 John Wesley Harding, a Brooklyn-based musician with great survival instincts who always seems to land cat-like while others around him are floating like corks in the ocean, takes the wraps off new album Who Was Changed And Who Was Dead (Popover Corps/RGB) on March 10. (You can pre-order it and download it immediately at Harding’s website.) Featuring Harding pals Scott McCaughey and Peter Buck from the Minus Five, as well as Mike Viola (Candy Butchers) and Steve Berlin (Los Lobos), Who Was Changed And Who Was Dead is Harding’s first rock recording since 2004’s Adam’s Apple. It returns the hyper-literate, sometimes caustic, Cambridge-educated folk-rocker to more familiar ground after he devoted much recent time to penning two novels (under his given name, Wesley Stace). In addition to the new record, which includes a second disc cut live in 2008, Harding unveils a British-music-hall-style extravaganza called John Wesley Harding’s Cabinet Of Wonders at New York’s Le Poisson Rouge on February 11, March 11 and April 15. Perhaps inspired by 1968’s The Rolling Stones Rock And Roll Circus, Cabinet Of Wonders will include novelists Jonathan Lethem, Rick Moody and Colson Whitehead, musicians Roseanne Cash, Graham Parker and Josh Ritter, as well as the odd stand-up comic and ventriloquist. Oh, and if you want Harding to play a show at your house and have a cool five grand to burn, email wesnews@mindspring.com.